Excuse the recurring theme here, but I am nothing if not committed to using up leftovers (often with scant regard to health) and I haven’t been in much this week, so, having used up the cauliflower in salads, I still have the lentils hanging over me like some delicious sword of Damocles. 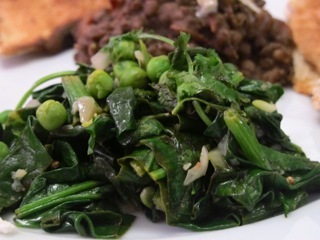 I also had half a bunch of spinach (the proper stuff, not the weedy, horribly iron-y baby leaves that now pass for that in supermarkets), so, after consulting Anissa Helou, author of the lentil recipe, I decided to make a coriander and spinach dish which, she claimed, worked just as well without the traditional minced lamb. Basic enough stuff: soften a diced onion with some ground coriander, add copious amounts of crushed garlic, a load of chopped fresh coriander and the spinach, stir to coat, cover, wilt and then dress with lemon juice. Zingy and fresh-tasting, in magazine parlance, and interesting to me because of the cooked coriander – I’ve never used it like that before, and it seemed to take the edge off that distinctive soapy flavour somewhat, which, although I love it, is probably a good thing when you’re sticking in great pawfuls of the stuff. Thanks to a vegetarian burrito run at lunchtime, guess what I’ve got for lunch tomorrow …? oh yes, and we had loads of peas courtesy of a freezer meltdown in Finsbury Park, so I chucked a load of those in too. The more the merrier when it comes to green stuff, I say.